great blue heron. . .
Blue Heron has been showing up often in my life the last 4 years. “The blue heron is a totem (symbol) of someone who has chosen to claim their life as their own. 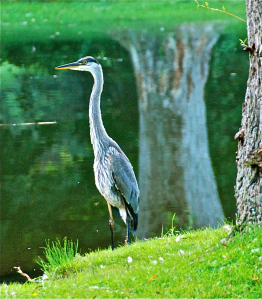 According to North American Native tradition, the Blue Heron brings messages of self-determination and self-reliance. It represents an ability to progress and evolve. The long thin legs of the heron reflect that even though we must be able to stand on our own, we don’t need legs that are great massive pillars to remain stable. Blue Herons have the innate wisdom of being able to maneuver through life and co-create their own circumstances.